On a red field with silver chevrons, divided in three parts. 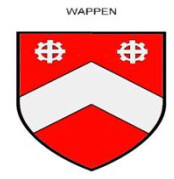 In the left, and in the upper right corner, the coat of arms has a silver milling wheel. To his children, especially to the miller's art and the miller's family inheritance of Peter Angne, and the mill at Würschhauser/Horschberg. * Seigneur de la Nothe le Roux - Chevronne de gueules et d'argent de trois pièce. A drawing of the coat of arms of Pierre Agne is presented here. Starting around 1500 the French Reformed church, with strong underpinnings from Calvin, began in France. The result was war and rumors of war from Catholics. From 1562 until 1598 there were the "Huguenot Wars." 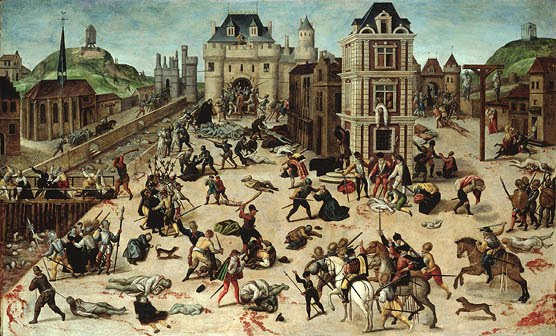 In 1572, on St. Barthelomew's Night (the massacre of Huguenots) it was said that "Huguenots" was an adaptation of the German word "Eidgenossen", which meant "Of one heart, mind, and purpose" to non Catholic Christians in Germany. It caught on quickly. They were not allowed to practice their faith – were chased from towns. At the time of Heinrich III (1574-1589), Pierre Agne, identified on page 5 under B, belonged to the Lords of Monte le Roux, a military company in Poitevins. In 1589 the Edict of Nantes, under Heinrich IV, was imposed, limiting the destruction of Huguenots and their settlements. In 1552 Metz had been conquered by the French, as were other area towns -- such as Pfalzburg, which belonged to the Pfalz (Palatinate*) Duchy of Zweibrücken. It was sold to Lorraine in 1583. The members of the Reformed Church left -- not without compulsion -- for the towns of Bischweiler and Zweibrücken, and other places. In 1623 the Kurpfalz (Holy Roman Electorate) of Lixheim was sold to Lothringen*. In 1681 Strassburg* was lost. From 1688 to 1697 the Oroberungskrieg (War of Conquest) was pursued by France, seeking to acquire the Pfalz (Palatinate) by force of arms. * Translators Note: The contested area bounced back and forth under French and "German" control. Lothringen was one part of Elsass-Lothringen in "Germany," which became Alsass Lorraine in France. "German" Strassburg became French Strasbourg. I put "German" and "Germany" in quotes, since Germany didn't exist as a unified nation until 1871. Before that it was a collection of Grand Duchy’s, Duchy’s, Principalities, Kingdoms, City-States, Holy Roman Electorates, and so on. The Pfalz (Palatinate) was a region containing many German" villages and towns. 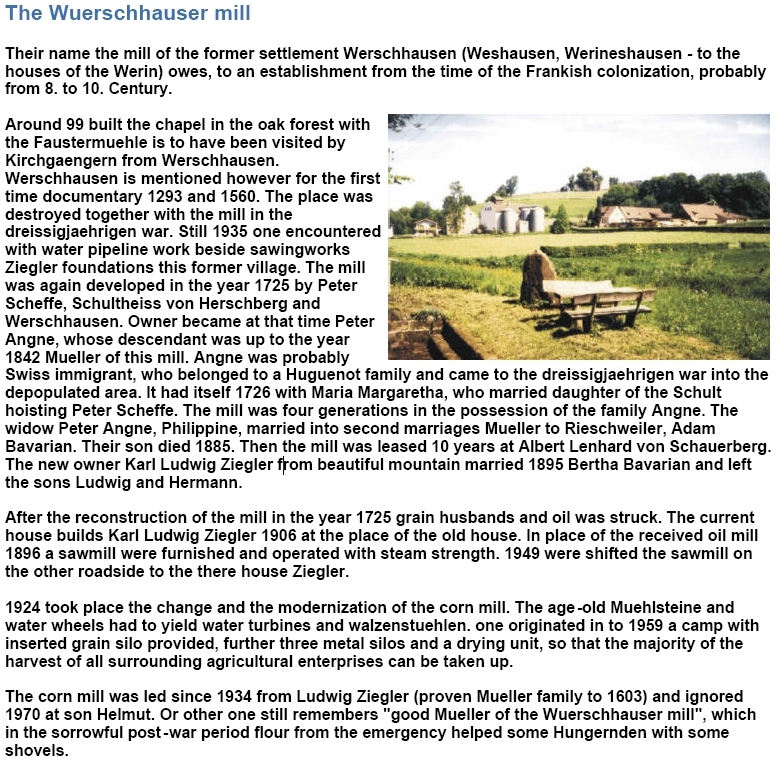 Bob Bergman has sent me something I want to share, for more on this article go to the following link; Würschhauser mill story. . . Thanks Bob Bergman for the Info . . .
Peter Agenet, Angne, Agne and Angone Baptized about 1650, died in Lambsborn about 1700-1702, found initially in 1673 in the PCR in Zweibruecken as Carpenter & Mill Construction. Married before 1674 to Ottilie Trautmann, French reformed, who had been baptized in Lambsborn/Zweibruecken 6 May 1655, died in Lambsborn 21 Feb 1730, she the daughter of George Trautmann who died before 1680, a farmer and mayor of the Vogelbacherhofe, and his wife Anna Elisabeth Roemer, daughter of Adam Roemer, mayor at Kasehofen. 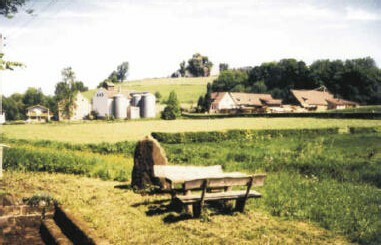 The Würschhauser mill, their name the mill of the former settlement Werschhausen (Weshausen, Werineshausen - to the houses of the Werin) owes, to an establishment from the time of the Frankish colonization, probably from 8 – 10 Century … Owner became at that time Peter Angne, whose descendant was up to the year 1842 Mueller of this mill. After A. Dauzat* (2)** Agnan (variant is Agne, in the central zone of France) is an old baptismal name which comes from the Latin "holy name" "Anianus". Aignan is a more French variation. The basis for Latin names was the wandering about of the people (due to wars and rumors of wars) and often the result of "vulgar (dialectical) Latin" incorporated into old French speech (3 and 4). The transitory forms of the surname are Anianus -- Anian -- Angnen -- Angne to Agne (compare lineanus to ligne). During the transition the letter "i" actually became a consonant. In the Elsass-Lothringen district* the French-German dialects produced Anguenet, Anquenet, and Arkane. It was the same for d'Agne, which became Daquenet (5). The first name-bearer in the Pfalz was Peter Agne (IVe), written at the same time in Zweibruecken as Angne, Agne, and Aganet (6 and 7). One can conclude that it was an unsettled name coming out of Metz, Pfalzburg, and Lixheim in France, a Huguenot name that he (Peter) acquired; that Agne is the equivalent of Anguenet. * Translator Note: "After" here could be citing a publication of some sort by its author, A. Dauzat. "After" is often used in the sense of "according to." Dauzat is a surname derived from the village Dauzat-sur-Vodable in the province Puy-de-Dôme in France. "Lineanus" is the Latin form of ligne. Both are word suffixes. Again, Elsass-Lothringen in the German language is a region known as Alsace-Lorraine in French. Today they are side-by-side provinces in France, bordering on Germany, much to the chagrin of the Germans. Ship Neptune would have looked similar too this ship. Dewalt Ankeny, an immigrant who arrived on the shores in the year 1746. Is found in the list of immigrants from the list of passengers on the ship Neptune which arrived at the port of Philadelphia on October 25, 1746, the name being given there as Dewalt Ancony. Dewalt settled in Lancaster County, Pa., somewhat west of Ephrata, in what is now Lebanon County, Pa.
Dewalt is written as Dewald, Dewalt, Dayvolt, Duval, Devault. The last name comes in even more spellings, Anconi, Ancony, Angne, Agnes, Angena, Acconi, and so on. It is now generally spelled Ankney, Ankeny or Ankeney. But, for my reference he will be Dewalt Ankeny. Dewalt first married Catherine, Her family name is not evident, but might possibly be either Lang or Hederick. Dewalt had many children, But I am going to focus on just my line, Christian, who was born December 25, 1749. About 1758, Dewalt marries Margaret Becker Frederick. It was about this time that Dewalt and Margaret moved to Maryland, settling at a place called Clear Spring, in the Conoquocheague Valley. Here he bought a small tract of land in 1764 he named this tract "Well-Pleased". He lived here during the remainder of his life and became one of the wealthy men of the region. His services to the Revolution are these; One of several patriots appointed by Committee of Observation on Dec. 30, 1776 “to form the county into companies (after the militia had marched) for the purpose of relieving the distressed inhabitants of the said county and also to compel the Dunkards and Mennonists to give there assistance.” Dewalt Ankeny which was listed as Devalt Anchony took the “Oath of Allegiance before the Hon. John Barnes before Feb. 28 1778. He died at Clear Spring in 1781. The burial plot has been lost and plowed over; so today there is only a memorial stone set up at St. Paul’s Church, on Highway #40, a mile or two east of Clear Spring, this cemetery being on his original estate and given for burial purposes by his son John. The inscription on this stone is: “To the memory of Dewalt Ankeny, the first of his name, and the founder of that family in America, one thousand seven hundred forty six”. The first settlements were made by Pennsylvania Germans prior to 1735, in the vicinity of Clear Spring. Among the settlers with Huguenot antecedents was Dewalt Ankeny. Information was edited by me as my interpretation from both book and Document. This is solely that and should not be taken as fact. Christian Ankeny (Just like his father had several names, so for my reference he will be Christian Ankeny) was the oldest son of Dewalt and Catherine Ankeny, born December 25, 1749 in Hanover, Pennsylvania. He was baptized in the Jonestown Reformed Church, December 23, 1750. Christian's mother died in 1757 when he was 8 years old. In 1771, Christian Ankeny married Elisabeth Shaver, (Shaffer) she was born July 14, 1748, daughter of George and Elizabeth Miller Shaver of Washington Co., Md. Christian and Elisabeth Shaver Ankeny had 9 children, but I am going to focus on just my line, Christian Ankeny, Jr. was born August 12, 1783, Christian Ankeny owned several tracts of farmland and was an active member of the Pioneer community. He served in the Revolutionary War as a First Lieutenant and a Court Martial Officer. He erected the first Grist Mill near Somerset and later built a Fulling Mill. His wife, Elisabeth Shaver Ankeny died in 1816 in Somerset County, and was buried on their farm. On April 7, 1817, in Somerset County, Pa. Christian Ankeny married Mary Kooser, a sister of the early settlers, John and Jacob S. Kooser. Shortly after, the family moved to Donegal Township, Westmoreland County, where Christian Ankeny had two tracts of land. He died, on March 17, 1824, aged 72 years, 2 months, "Christian Ankeny was buried in the Brant's Cemetery adjacent to the old German Reformed Church. The location of the grave of his second wife, Mary Kooser Ankeny who died in 1847, is unknown. Information was edited by me as my interpretation from the book. This is solely that and should not be taken as fact. William B. Ankeny, born on 1 Oct 1819 in Cook Twp. Westmoreland Co., PA William married Elizabeth Shaulis, daughter of David Shaulis and Ann Maria Switzer. Elizabeth was born on 17 Jun 1820 in Somerset Co., PA. They had 11 children: They had 11 children, but I am going to focus on just my line, Norman B. Ankney was born October 1, 1819. William died on 5 Sep 1900 at the age of 81, and Elizabeth, She was 79 when she died on 25 Mar 1899. Both where buried in Pleasant Grove Cemetery, near Ligonier, Westmoreland Co. PA.
Now as far as my line goes this is the point that I see the change of William Ankeny to Ankney, and from this point on as far as Norman B., This is the solid turn point for Ankney’s name spelling. So from this point on I will continue with Ankney. Christian Ankeny, Jr., was born May 13, 1782. Christian Ankeny, Jr. married his first cousin Mary Shaver in 1808. She was born April 12, 1792 the daughter of Peter and Elizabeth Earhart Shaver. They had 9 children, but I am going to focus on just my line, William B. Ankeny was born October 1, 1819. They lived in Somerset and later moved to Cook Township, Westmoreland County, Pennsylvania, Christian Ankeny, Jr. was a farmer and owned farms in both Somerset and Westmoreland Counties. He was a veteran of the War of 1812. He died June 1, 1864, Mary died February 11, 1863, both in Westmoreland County. Both he and Mary are buried at Pleasant Grove Cemetery, where it is one of the oldest Presbyterian Churches in Ligonier Valley. Christian Ankeny, Jr. died at the age of 82 years. Now as far as my line goes this is the point that I see that Christian Ankeny Jr. is a solidly spelled Ankeny, and from this point on as far as Christian Ankeny Jr., This is the solid turn point for Ankeny’s name spelling. So from this point on I will continue with Ankeny.